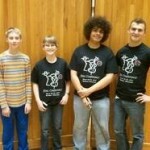 News - Page 3 of 3 - Richard Davis Foundation for Young Bassists Inc. News - Page 3 of 3 - Richard Davis Foundation for Young Bassists Inc. 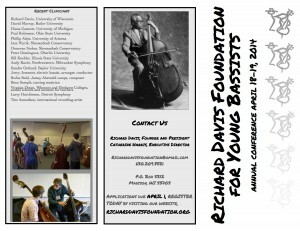 The Richard Davis Foundation for Young Bassists annual conference supports two evening concerts after an invigorating day of classes. 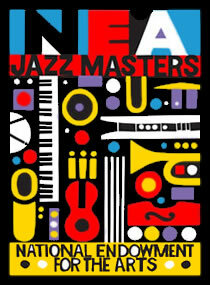 Saturday’s concert features the clinicians and foundation alumni, and Friday is an all conference mega bass orchestra. Every year after leaving the Saturday night concerts, I can’t help but think, “that was the best concert ever, there is no way that it could ever be topped!” This year was no exception. This year, as always, the faculty stunned and amazed with a broad diversity of different styles and musical sounds including electric bass, ampeg baby bass, and a range of upright double basses. I think the thing that set this year apart the most, was the cozy Music Hall venue. Here, it was easy to witness some of the more tender and intimate sounds and nuances of the double bass. The clinicians carefully programmed the concert to take listeners on a sonic journey. Full Clinician Concert Program. 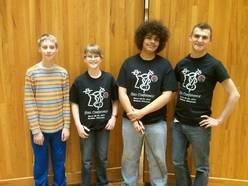 Friday night, students gave enthusiastic small group performances in trios to quintets and more. Following all small ensembles, all bass players united into a huge, two-tiered bass orchestra that spilled off of the stage onto the apron in the house. It was a true surround sound moment. Full Friday Student Concert Program. You! if you live or work in Madison, come check out the Soup on Sunday. Remember, the presenters with the most votes are the ones that get the $$ ! Tickets reserved or purchased ahead of time online. There will be one other charity at the soup this Sunday, The Lang Family House of Terror, a fundraiser to provide alternative activities for teens fighting addiction. What is the Madison Soup? The Madison Soup is a micro-granting organization that seeks to support projects that benefit the Madison area community. They bring in chefs from local restaurants to cook 2 (veggie and vegan friendly) soups, served while the local non profits are giving presentations. Attendees pay $10 for the meal (Menus different every time–March 16 menu available here), and listen to 2-5 non profits and charities present information about their projects. Once everyone has presented, the audience (the diners) vote on the project that they want the money to go to. All of the proceeds from the dinner go to the organization that gets the most votes. 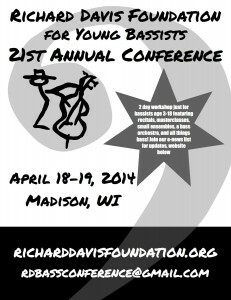 2014 Bass Conference Poster and Brochures NOW HERE! Want to spread the word ? Problem solved. PRINTABLE (black and white or color) posters now here thanks to the sweet skills of our fantastic graphic design team. But what to do with these sweet informational sources you ask? Post at your school, youth symphony, hand them out to your friends, keep an extra copy in your bass case, show it to your private lesson teacher, share it with your mentor/mentee, tape it to your music folder, origami it into an electric bass, origami it into an upright bass, color it in yourself, the possibilities are endless! http://www.richarddavisfoundation.org/wp-content/uploads/2013/12/logo2.png 0 0 Catherine Harris http://www.richarddavisfoundation.org/wp-content/uploads/2013/12/logo2.png Catherine Harris2014-03-02 03:39:032014-03-02 03:53:012014 Bass Conference Poster and Brochures NOW HERE!